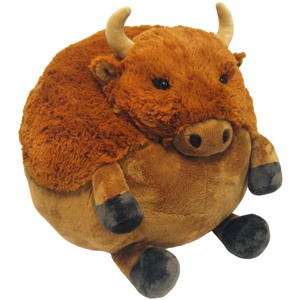 Squishable Buffalo: An Adorable Fuzzy Plush to Snurfle and Squeeze! Buffalo is a massive mammal native to North American grasslands! Buffalo is a city on the shores of Lake Erie! Buffalo is a verb that means �to badger!� Buffalo is the plural of Buffalo! A buffalo can buffalo a buffalo from Buffalo into buffaloing other buffalo! Buffal-whoa! Despite all of that grammatical heavy lifting, allow us to add another definition to what is already a hefty dictionary entry. �To Buffalo� is hereby a verb meaning �to squeeze a giant stuffed shaggy four-legged symbol of the rustic West and never let go.� You should really call the dictionary people and buffalo them into adding it. My first Squish and I was not disappointed!! I ordered a mystery squishable because I was new to squishable.com at that time,so I didn't know which one to pick.when I opened up the box,I was in shock of happiness!when I showed my friend,she was In shock too!I named him Dave and I loved him till this day,and I still do!I advise you to get it to snuggle with too! I love this little guy! He was sent to me from a fellow squisher during the 2016 squish swap. When I opened the box, I was really surprised! He is one of my favorite squishes I have so far. I love my little buffalo! Let me start this review by stating that there are needs and wants in life, and Bert the Buffalo is definitely a NEED. Bert the Buffalo was my 2nd necessary purchase from Squishable, and there have already been more since, but he has his own original splendor and AWESOMENESS that none can surpass. I love his horns and tail, and suuuuuper soft velvety fur! I love his tiny hooves, which complete his regal look. He will be loved forever, thank u Squishable! I bought him on the cyber Monday deal and boy am I happy with him! Perfectly round and fuzzy! I'm already planning on buying him a friend.